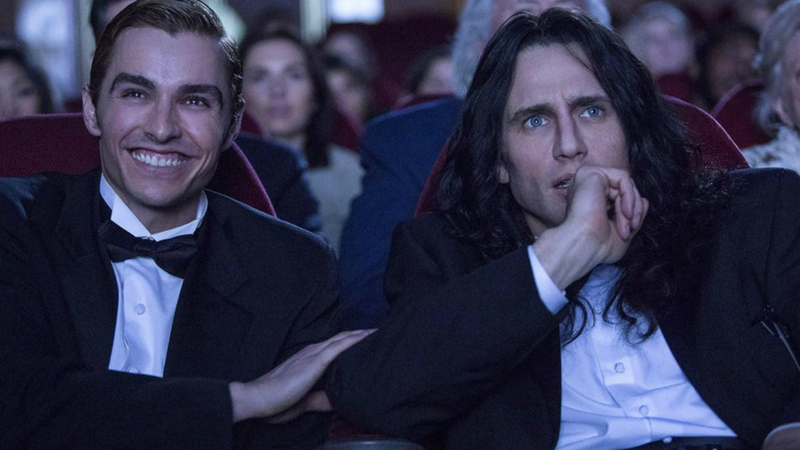 While The Room is known as a cult-film for wholly negative reasons, The Disaster Artist thankfully avoids becoming a calamitous sham which would make even Tommy Wiseau blush. When James Franco announced his intentions to play the infamous Tommy Wiseau in a biopic film based around his disastrous The Room, which has gone on to top many lists of worst films of all time, I was not alone in scepticism. Although it was going to be based on the excellent non-fiction book by Greg Sestero and Tom Bissell, which details the making of Wiseau’s cult failure, most attempts to do this for other books have failed quite spectacularly. Usually this is due to a need to shoe-horn in unnecessary subplots, often romantic, and dilute the actual audience interest away from the real substance of the story. The Disaster Artist focuses around the four year period when Greg Sestero met the mysterious young Tommy Wiseau, a clumsy but fearless actor who believes he can be a star. Over the next three years, they produce The Room– a domestic drama film, which despite a hefty production budget suffers from poor management, verbal abuse and the refusal of basic needs for the crew. The test-showing of the film results in Wiseau becoming a laughing stock. Thankfully, The Disaster Artist avoids dropping into this punctuating this pseudo-coming-of-age story with a skillful blend of comedy and drama, navigating the difficult issue of what is essentially a life punctuated by total failure. This is largely due to the brilliance of James Franco who steps into Wiseau’s shoes with aplomb. He lurches from childhood excitement and happiness to breaking point as the plot progresses and his anger and passion seems genuine, rather than manufactured. His relationship with Greg Sestero (Dave Franco) develops with a necessary pace and the collapse in friendship is genuinely moving and at times quite upsetting, but the bittersweet ending works perfectly in the grand scheme of the narrative. Sestero is forced to choose between a genuine chance at an acting career- due to a true-to-life chance meeting with Malcolm in the Middle and soon-to-be Breaking Bad star Bryan Cranston- or his friendship with the fearless albeit bizarre Wiseau. James Franco adds a new dimension to Wiseau’s character: one with great dreams who is easy to sympathise with at times, whilst at times being so aggressive and narcissistic it is impossible not to want his film to fail. His jealous, dejected temperament during his frustrated scenes with Dave Franco’s Greg is one of the highlights of the film; it seems like a genuine glimpse into the soul of a tortured man who believes he is some kind of filmic genius. That said, their relationship is certainly the highlight of the film. Seth Rogan’s perormance as Sandy Schklair is average at best, while Ari Graynor (Juliette Danielle/Lisa), Josh Hutcherson (Philip Haldiman/Denny) and Jacki Weaver (Carolyn Minnott/Claudette) never really receive the development necessary to truly understand their characters. Alison Brie does steal the limelight at times as Sestero’s long-suffering girlfriend Amber, but ultimately again doesn’t spend enough time on screen to really have an effect. Brandon Trost’s cinematogrophy and Stacey Shroeder’s editing must be praised for creating a perverse voyeuristic look into Wiseau and Sestero’s lives, ironically echoing the plot of Wiseau’s so-called ‘masterpiece’. The post-credits scene raises a great laugh considering how absurd it feels and the credits, comparing scenes of The Disaster Artist to The Room work excellently to demonstrate the excellent job James Franco has done in stepping into the shoes of Wiseau, albeit at times highlighting just how poor the original film is. While The Room is known as a cult-film for wholly negative reasons, The Disaster Artist thankfully avoids becoming a calamitous sham which would make even Tommy Wiseau blush, but whilst poignant and at times hilarious, it does sometimes suffer from a jerking, incoherent plot. The Disaster Artist (2017), directed by James Franco, is distributed in the UK by Warner Bros., certificate 15.